Patriotic biker girl!, originally uploaded by jahansell. 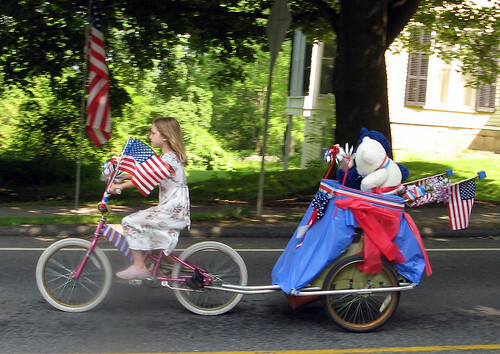 It was hard to choose just one photo of the Sharon, CT Memorial Day Parade to represent the entire day - I have so many I like (and here they all are - please click and view and, if I do say so myself, I recommend the slideshow version!) I may yet switch to another phot, but please take a moment to view the set, as they give such a flavor of my small town and how everyone comes out on a day like this. We put politics and any other differences aside and just take a moment to remember those who died serving in the armed forces - simple as that. You have many fine photos of the parade--and so many! I think you chose the right one, tho. It gives the flavor of both a parade and a small town extravaganza on an important day. Well-done!! A great photo to choose; it encapsulates the fact that you're never to young to appreciate and remember the many sacrifices made by the troops. I think this is your best shot that represents the parade the best. It's as you say, the portfolio really conveys a strong sense of the town community, and how the day is marked. To anyone looking in from outside, without much knowledge of the way US society really lives its life, it should provide a fascinating insight, because it shows an insider's glimpse of something with which we aren't familiar. Thank you for the reportage! Technical question: Canon Powershot? What about the Nikon? Ah, my Nikon was sitting quietly on my desk, lacking a charged battery. For two weeks after I got home I was searching for the charger and a few other mysteriously missing items, all of which I decided must be in a missing tote bag. I called and emailed my mom to see if I'd left them there, and searched high and low, meanwhile using the Canon instead. (however Paula is from the Nikon - my last pics on that first battery charge!) At last, last night, I found everything I'd misplaced (in obvious places, that indicate I need to do a better job keeping my stuff organized) and I can go back to the new camera!